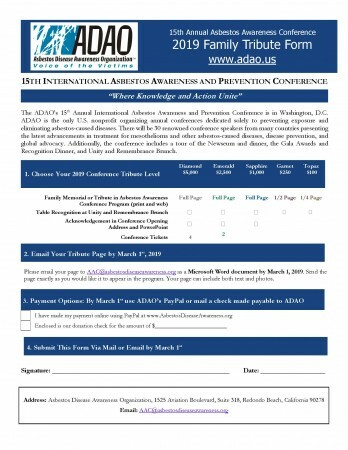 Time has taught us that “It Takes a Village.” As our ADAO village prepares to convene for our 15th Annual Asbestos Awareness and Prevention Conference this April, we’d like to offer you the opportunity to support the cause and honor your Mesothelioma Warrior with a conference program tribute page. Designing a tribute page is simple and allows your message to be heard around the world, as the conference program is shared with members of the U.S. Congress, international health officials, and at educational events such as Congressional Staff Briefings or regional awareness programs. By placing a family tribute in our conference program, your donations will support ADAO’s continued mission of education, advocacy, and community support efforts. Whether it is an individual tribute, or a community one shared between friends and family, we look forward to beautifully displaying your tribute in our program and sharing it during our education and advocacy initiatives throughout 2019. The deadline to submit a tribute page is March 10, 2019.  If you have any questions, please send an email to info@asbestosdiseaseawareness.org.